Over 1.5 million square feet of high tensile XR-5 is used as a landfill liner. Location: New Hudson, MI U.S.A. This sanitary landfill, owned by Browning Ferris, employed 1:1, 190 foot slopes. 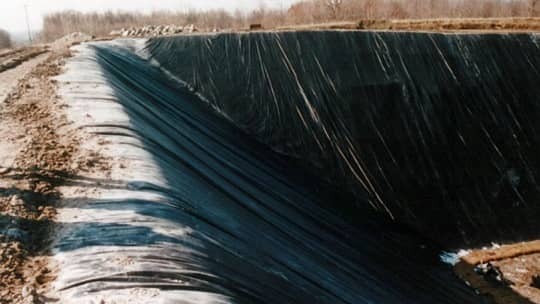 Over 1.5 million square feet of XR-5 was used to line this landfill, where only a high tensile strength geomembrane would perform. Wedge welding up the slope was used to make field welds to join the large prefabricated panels.